Long before he signed with the New Jersey Devils as an undrafted free agent in 2005, David Clarkson was learning the fundamentals under the tutelage of Brendan Shanahan. Both Clarkson and Chicago Blackhawks forward Dave Bolland both attended Brendan Shanahan's Hockey School at the Lakeshore Arena in Canada in the mid-1990s as kids. "I did if for three or four years and it was amazing," Clarkson told NHL.com. "It's funny when I look back on it now because at the end of the hockey school each year, Shanny would hand out a stick to a kid that had the best week and I almost ended up getting a stick every year. I still have those gold aluminum sticks at home today so it's pretty special." It had to feel just like old times last season with the Devils when Clarkson had an opportunity to play on the same forward line with Shanahan and Dainius Zubrus -- the team's most productive checking unit in 2008-09. "Shanny has so many great stories and he's been through it all," Clarkson said. "There's a lot you can learn from a guy like that. He dishes and moves the puck so well and can see the ice; he's never lost that and it's a huge part of his game." It appears the future is now in New Jersey. Why else would veteran forward Brendan Shanahan and the Devils part ways Thursday after the 40-year-old left wing had just signed a $1 million contract to return to New Jersey in August? According to Devils President/CEO/GM Lou Lamoriello, the emergence of several prospects, including wingers Niclas Bergfors and Matt Halischuk, and the acquisitions of Rob Niedermayer and Ilkka Pikkarainen, played a big role in Thursday's decision. Bergfors and Halischuk each starred for the Devils' American Hockey League affiliate in Lowell last season, combining for 36 goals and 80 points. "Certain players have to play, they have to grow," Lamoriello told reporters. "And there's only one way for that to happen, and that's for them to be in the lineup. Especially with what we have seen of them in training camp from Day One." While Shanahan remains on the 23-player roster for now, Lamoriello told the media following Thursday's practice that a final decision will be made later. Shanahan, who was a no-show at New Jersey's morning skate Thursday at Prudential Center, explained his decision via a prepared statement through by the Devils. 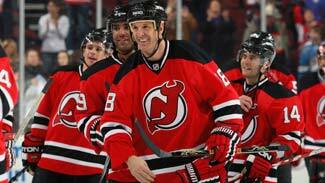 "I have decided not to continue with the New Jersey Devils for my 22nd NHL season," Shanahan said in the statement. "When I signed this past summer, Lou Lamoriello, Jacques Lemaire, and I agreed that if we were unable to find a suitable fit in which I would be able to compete and contribute at the level I expect from myself, then I would simply step aside." Shanahan ranks 11th all-time with 656 goals -- first among active players in the League -- and 23rd all-time in points with 1,354 -- second among active players. He posted 6 goals and 14 points in 34 games last season after being acquired by Lamoriello last January 10. "I have great respect for Lou, Jacques and the entire Devils organization," Shanahan's statement continued. "The decision was both mutual and amicable." It's still uncertain whether or not Shanahan will latch on to another team or just call it quits at this stage of his career. "I am planning to spend the next couple of weeks with my family to reflect on and evaluate my plans for the future," he said. "Most importantly, I would like to thank my former teammates and wish them the best of luck for this season." The sticking point came when Shanahan learned he would not be receiving a significant amount of playing time on any of the team's top three lines -- something he anticipated after speaking with coach Jacque Lemaire during the offseason. A reduced role obviously was something that didn't sit well with the eight-time NHL All-Star. "This past summer we sat down and spoke about him coming back, both he and I and he and Jacques sat down and looked at the big picture as far as the coming season and at that given time with the makeup of our team, the role that Brendan wanted to play, and certainly felt he could and we also did too was a certain role," Lamoriello told the Bergen Record. "Over the past several days, Brendan and I, as well as Jacques, have had conversations that the unexpected has transpired, the emergence of several of our young players at a level that for them to go to the minors would not be in our best interest as progression and getting better and also as far as the team goes."